The Outworldz program uses Universal Plug and Play (uPnP) to automatically allow data to come from the Internet to your computer. This is called "Port Forwarding". uPnP capability may be disabled in your router, or it may not support it. 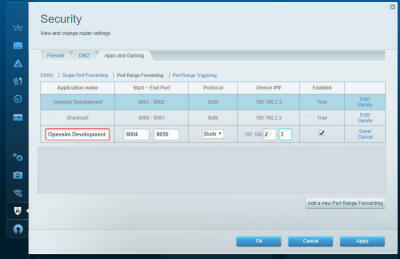 Port forwarding is necessary in this application if you want to be able to access the Hypergrid. If your router does not support it, you can access your routers firewall menu and add port forwarding. Here is a list of routers and how to program Port Forwarding. Additonal Information on Port Forwarding can be found at http://www.portforward.com. Please note that if you are using consumer network hardware, you will also need a router that supports NAT loopback. See Loopback if you want give both LAN and external users access. 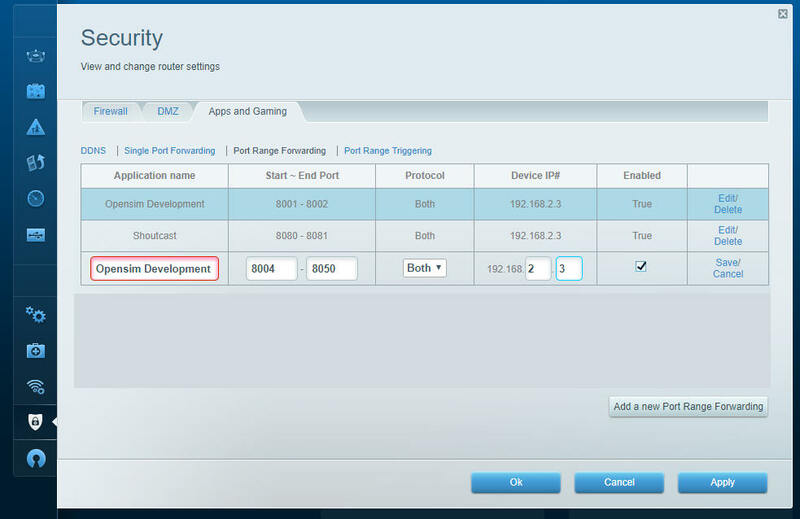 Click the Advanced button to see which ports you are using. The defaults are 8001 (Diagnostic), 8002 (Public) , and 8004 (Region). If you have manually added more regions, their region ports also needs to be open. 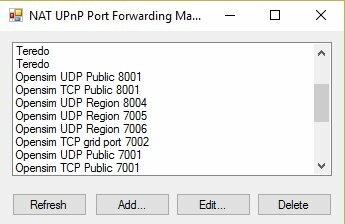 Always Port Forward the Diagnostic (8001), Public (8002), and Region (8004) ports to the LAN address of this machine on both UDP and TCP. When you first start the system, the software should automatically prompt you to open the Diagnostic (8001), Public (8002), and Region (8004) ports in the firewall. These must be open for both UDP and TCP. If it still fails after the above steps, temporarily turn off the firewall on the PC and try again. if it works, both ports need to be opened in your PC's firewall and the firewall should be re-enabled. This program really needs two things to work: Forwarded ports, and Loopback. A list of routers and instructions is at www.portforward.com which can help once you identify your router type. Step 1) Get your PC LAN IP address by going to a DOS prompt and typing 'ipconfig'. In the above photo, my IP was 192.168.1.3. Yours is likely to be in the range 192.160.*. *, but it could also be a 10.0.*. * number. The Shoutcast setting for 8080 and 8081 is used when you are running the Icecast/Shoutcast server. Which ports? You need to Port-Forward 8001, 8002, and 8004-8010 (or higher, I usually open up to 8050) to have room for expansion. You can also add 8080 and 8081 for Shoutcast/Icecast. Don't do 8003 for security reasons. These can usually be done in ranges, like 8001-8002 and 8004-8010. The latter ones are for regions - you need one port per region, so this would let you have 7 regions. Add more if you want - nothing wrong with opening up to 8020 or 8030 or so. In the above photo, I have opened up ports 8004 through 8005. They need to be open for both TCP and UDP. Your router will have a button or a pulldown to select UDP, TCP, or both. If you don;t have a Both or All option, you have to add them twice, once for UDP and once for TCP. How do I know this worked? You can tell if it worked by starting Opensimulator, and then use a web browser to go to http://www.canyouseeme.org, and enter 8002 when Opensimulator is running. If that works, the ports are fine. The second part that has to work is loopback - either your router supports it, or not. You can immediately tell if your loopback works after running the above CanYouSeeMe.org tests. You use your web browser to navigate to http://(YOUR PUBLIC IP):8002. Mine was http://24.173.0.66:8002. 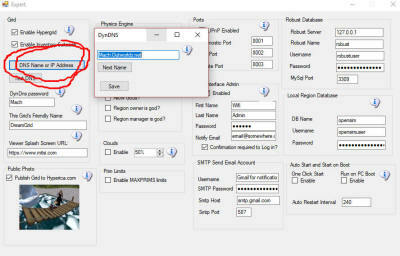 Of course, your IP address will be different than shown here, so use whatever CanYouSeeme shows you. If the system is working, you get a web page. 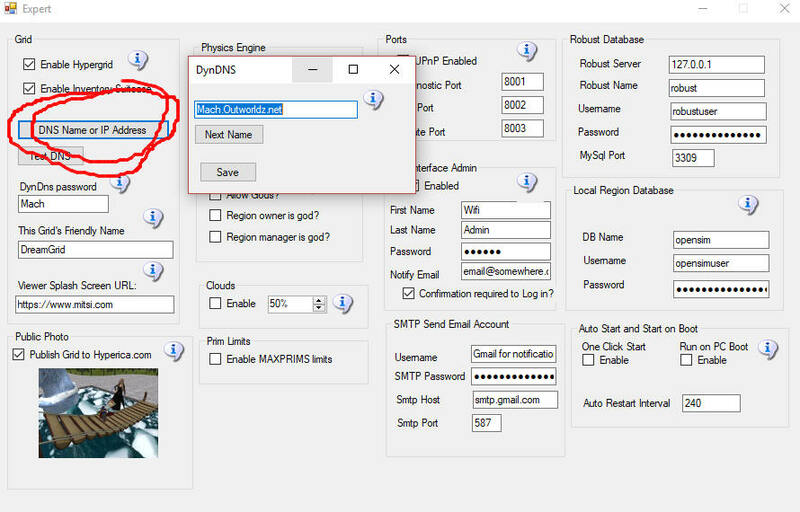 If it works, go the the Settings->Expert Settings menu, and click the DNS Name field. Either click Next Name until you see one you like, and press Save, or type a name like 'Whatever.Outworldz.net". The name will not work with spaces, and no funny characters. It uses letters, numbers and a dash ()-) only. Then click Save, and restart Opensim. You use your web browser to navigate to http://(YOUR NEW NAME):8002, such as http://Whatever.Outworldz.net:8002. If you get the web page, use that same name to add the Grid Settings to your viewer, and you should be set to go. What to do if the loopback test fails. Click Add the Windows Loopback Adapter and follow instructions. Usually you can just run the Help-Network Diagnostics. And you may want to troubleshoot manually.